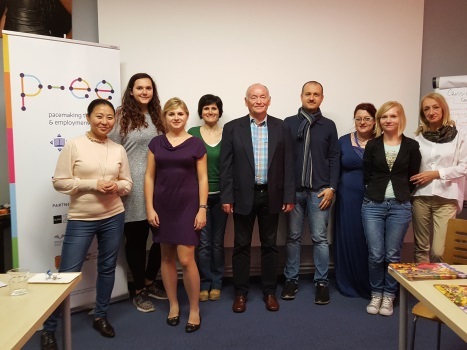 4th Transnational Project Meeting was held in Prague, Czech Republic, from the 26th of September 2017 to 29th of September 2017. 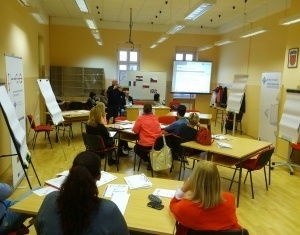 The host of the meeting was the Czech partner Slovo 21. At the meeting, the Progress of the project and the analysis of the current situation after 11 months of the implementation was presented. Also, further tasks of project partners were discussed. Franco Tibaldi, as coordinator of the Italian partner INFOR ELEA, the partner responsible for the making of the 3rd Module of the Curriculum, presented the structure and the themes of the 3rd Module. 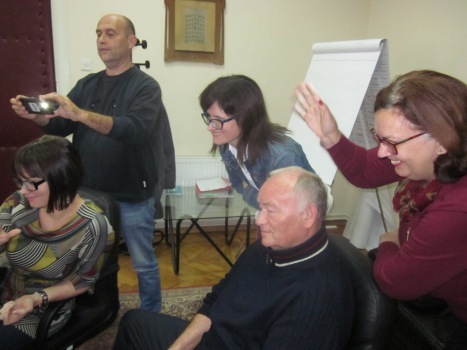 Bo Daskalova from the English partner MBM Training and Development Center, the partner responsible for making of the 4th Module of the Curriculum, presented the structure of the 4th Module through an interactive workshop, by playing roles. Franco gave the overview of the next Transnational Project Meeting, which will be hosted by INFOR ELEA in nearby of Torino, Italy. The host organized sightseeing in the afternoon of both working days of the Meeting. The participants of the 4th TPM were: Emilia Szczygielska, Franco Tibaldi, Monika Peulić, Bulgan O. Rico, Jelena Silajdžić, Bo Daskalova, Alina Martinkute, Josip Nakić Alfirević and Irena Babić. Vilniaus Židinio saugusiuju gimnazija from Vilnius, Lithuania as the partner responsible for the making of the 2nd Module of the CurricuIum made the contents of the module ''Modern Communication Technologies''. Alina presented it at the online presentation via Google Hangouts to the listeners/representatives of the partner organizations. There is also the brochure ready with the contents of the 2nd module. Spoleczna Akademia Nauk from Lodz, Poland as the partner responsible for the making of the 1st Module of the CurricuIum made the contents of the module ‘’Adult Education teaching models’’. Adam Gogacz as the expert who worked on the module, presented it at the online presentation via Google Hangouts to the listeners/representatives of the partner organizations. He made also the brochure with the contents of the 1st module. 3rd TPM was held in Liverpool and was hosted by the UK partner MBM Training and Development Center from the 10th to 11th May 2017. From partner organizations, the meeting was attended by: Alina and Ilona from Lithuania, Monika from the Czech Republic, Robert from Poland, Franco from Italy, Bo and Milena from the UK and Josip Nakić Alfirević as representative of the Project Coordinator. The agenda included Alina's presentation of the 2nd Module of the Curriculum, discussion on eventual modifications, other partners' suggestions. At the end of the working part of the meeting Franco from INFOR ELEA presented their vision of the 3rd Module of the Curriculum ''Human Resources: research, analysis, planning and implementation''. The cultural part included visits to famous places linked with the Beatles and getting familiar with the British Tea ceremony. 2nd TPM was held in Polish city Lodz, the headquarters of the project partner Spoleczna Akademia Nauk, who was hosting this meeting. The meeting was held from 22nd to 24th February 2017. From partner organizations, the meeting was attended by: Alina and Elvyra from Lithuania, Monika from the Czech Republic, Robert from Poland, Franco from Italy, Bo and Milena from the UK, Alan and Josip Nakić Alfirević as representatives of the Project Coordinator. The agenda included Robert's presentation of the 1st Module of the Curriculum, discussion on eventual modifications, other partners' suggestions. At the end of the working part of the meeting Alina and Elvyra from Vilniaus Židinio saugusiuju gimnazija presented their vision of the 2nd Module of the Curriculum ''Modern Communication Technologies''. 1st TPM was held in Koprivnica, the project coordinator's headquarters in Koprivnica, Croatia, from the 18th to 21st October 2016. From partner organizations, the meeting was attended by: Alina Martinkute and Ilona Filipenkovaite from Vilniaus Židinio saugusiuju gimnazija (Lithuania), Jelena Silajdžić and Monika Peulić from the NGO Slovo 21 from Prague (Czech Republic), Robert Klarecki from Spoleczna Akademia Nauk from Lodz (Poland) , Franco Tibaldi from the consortium Infor ELEA from Turin (Italy), Bo Daskalova and Milena Ilieva from the MBM Training and Development Center from Bristol (United Kingdom), Irella Bogut and Maja Koporčić from the Faculty of Education of University in Osijek, as well as members of the Open University Koprivnica project team as Project Coordinator: Josip Nakić Alfirević, Ksenija Krušelj, Alan Juraković, Maja Holek, Krešimir Štefanić and Irena Babić. The working part of the meeting included getting know with general project information, methodological instructions, agenda, project documentation, data collection and analysis, research methodology, curriculum development - instructions, rules and explanations. 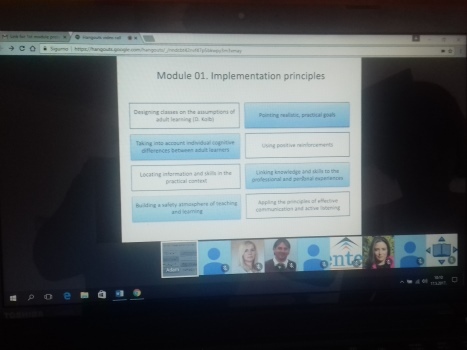 Robert from Poland presented how a Polish partner imagines the first module of curriculum, which refers to Andragogical teaching models. 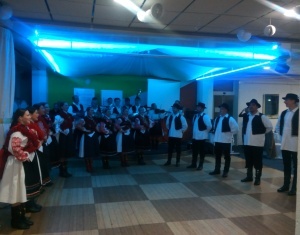 The cultural part of the meeting included wonderfull performances of the Folklore Ansemble Koprivnica – dance section and tambura section, under the guidance of Mrs. Nada Šešić, which were exciting for our foreign partners. There was a very nice tour of the Hlebine Art Gallery thanks to the curator Mrs. Helena Kušenić and a meeting with the Association "Step by Step" and its president Mr. Franjo Horvat, who spoke to foreign guests about the situation and problems of the Roma Minorities in Koprivnica-Križevci County and led the visit to the Roma settlement in Botovo. 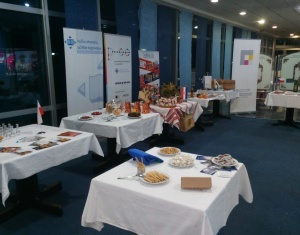 Two evenings, thank to patronship of the City of Koprivnica and the biggest food-processing factory in Croatiaa, Podravka, were the opportunities for presentations of each partner and better knowing each other. First online video conference was held on the 8th of October 2016 via Google Hangouts. All the partners' representatives were present at he conference. That was the opportunity to see each other for the first time, even though through the picture on laptop. These online conferences are meant to be for coordinating purposes, so, this first one was all about the details of the organization of the 1st Transnational Project Meeting to be held in Koprivnica, Croatia from the 18th to 21st of October 2016. Until now, there were 11 coordinating online meetings held in the project. Project „Pacemaking the education and employment: answers to new challenges and opportunities“ is funded by the European Union's Erasmus+ program. Open University Koprivnica is the Project Coordinator in the project P-EE, which is funded by the European Union, Erasmus+ KA2. In project participate partners from Italy, Czech Republic, Lithuania, Poland, UK and one more partner from Croatia, besides the Project Coordinator.